Welcome to my humble abode! Please take no notice of the dust on the shelves, the hand-me-down furniture and the fact that you can barely walk around the kitchen table without bumping something…it’s all about the food, you know! Even that may not always look so fantastic, but I put a lot of effort into both taste and nutrition. I take deep joy in watching guests appreciate my food as they eat, and a sort of secret glee that I’m serving something that’s probably healthier than anything they’ve had in a long time. I see hosting visitors or bringing a dish to pass as a challenge: how can I make something people will truly enjoy, that has either a hidden or overt powerful nutritive boost, and that is frugal enough that I don’t mind sharing, even if by chance no one appreciates the effort? 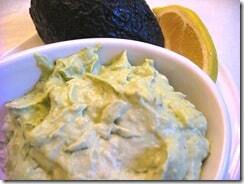 A dip is the perfect grab and go dish for a big gathering, in my opinion. People love to be able to cruise the appetizer table, grab a cracker or veggie, dunk, and be on their merry way. This one fits into this week’s theme of Fighting Germs Naturally perfectly with its fresh garlic. More on garlic tomorrow! With a gorgeous autumn orange offset by the deep green of fresh parsley, this simple, nourishing spread has everything going for it: seasonality, aesthetics, quick prep, and even an immunity boost for the folks rubbing shoulders while they sample your real food appetizer. 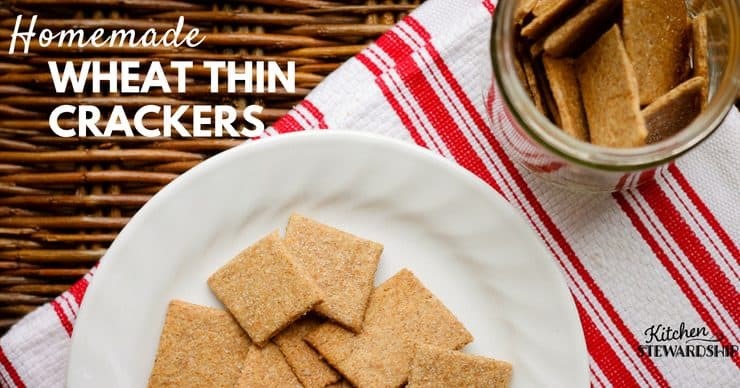 I serve it with homemade sourdough crackers, but it’s even better with my other homemade cracker recipe that tastes just like Wheat Thins. Why yes…there are four garlic cloves in this photo. It was zangy, with emphasis on the ZANG! 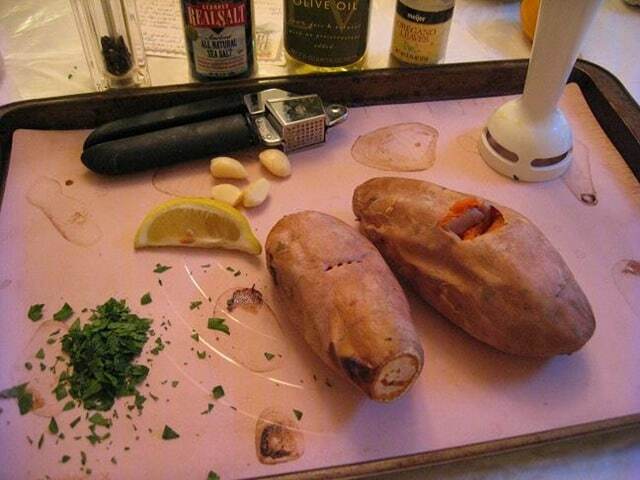 Bake sweet potatoes until soft. I like to simply scrub the skins, place the whole potatoes on a cookie sheet or baking dish, and bake along with another meal I’m making sometimes a day or two before I need to make the appetizer recipe. If baking alone, 400F for 45-60 minutes should do the trick, depending on the size of your sweet potatoes. Cool completely, then peel and place into a medium bowl. Mash somehow or another: a hand blender is my favorite, but you could use a food processor, a potato masher or even a sturdy fork. Optional step: sauté the garlic in the olive oil over low heat until aromatic. I usually choose to skip this step and just go with fresh for the immunity-boosting properties of raw garlic. Add garlic, oil, and all the other ingredients to the mashed sweet potatoes and mix until uniform. You can adjust the garlic to taste: more for adults who love it and less for children. Keep in mind that the intensity of the garlic will increase quite a bit, even if the spread only has to wait in the refrigerator one night. I like to add a bit extra lemon juice, because that zing gives the whole dish something special to talk about. Tip: Plan to make homemade chicken stock the same week you need to take this dip somewhere so that you can buy one bunch of fresh parsley without waste. You can serve the sweet potato spread with crackers of any kind (I’d recommend Wheat Thins if you’re going with purchased crackers; the sweetness is actually just perfect to compliment the garlic). Other tasty options include tortilla chips, toasted pita chips, mini bagels, or even fresh vegetables. It’s especially attractive on cauliflower florets. My son requested that I made the homemade crackers and this dip for the teachers at his school when they had to stay late for parent-teacher conferences. I just love that it seems par for the course for him to expect his mom to make homemade crackers to share, and that he thought others would love them (they did!). One of its ingredients is yogurt cheese (or goat cheese if you’re not feeling frugal), so there’s also a bonus video demonstrating how I make yogurt cheese and whey. 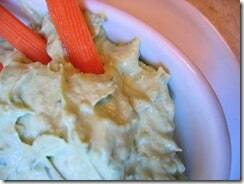 I admit that the avocado dip went over much better with the teachers, but I (ahem) kind of forgot that the garlic would intensify so much in the sweet potato dip. Perhaps they were afraid they’d knock out the parents with their garlic breath! 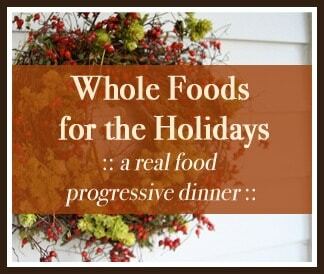 I’m so pleased to play hostess for this week’s real food progressive dinner. Please see the full list of participants and upcoming themes HERE. You can also check the soup posts in last week’s carnival (Mine = black bean soup). Disclosure: I am a teacher for the GNOWFGLINS eCourses and also share in the payments from my own readers. I just love this progressive dinner! 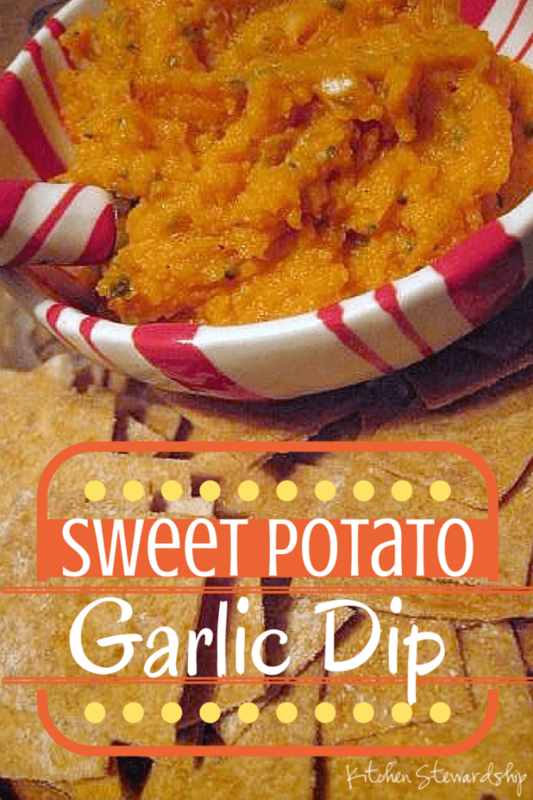 I’ll be your testimonial of sorts on this one….the Sweet Potato Garlic Spread is awesome! I loved the one you made for the meet-up in October! My oldest sister loves garlic and she loves to cook. I have to share this recipe with her. When I first saw the pics I thought it must be pumpkin, as per the holidays, but this sounds so tangy and yummy. Maybe if I share it with her she’ll do the making (she’s an excellent cook) and she’ll share with me! Thanks Kitchen Stewardship! How did I miss this one, Katie?!? This has one of my favorite foods — sweet potatoes. We’ll certainly give this one a try.